How boring life would be without challenges! 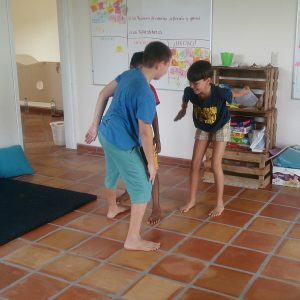 So, a week later I can say that we´ve kind of resolved the inertia of certain kids in Explora. As a teacher I know how important it is to back off and give students space instead of demanding immediate response to for example questions. However I hadn´t thought that the mere presence of the facilitators would strangle the intention setting process. We backed off (and literally out of the room), and the kids actually started talking to each other, making more plans together instead of setting intentions on a pure individual basis. That was the first step. The second was to gently but surely make the kids understand we´re not there in order to play with them or entertain them. This has been easy for some children, and a lot harder for others. Knitting – on their own initiative! 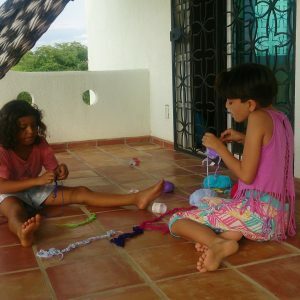 What we´ve noticed is that all the kids that are bi-cultural (one parent is Mexican and the other is from another country) have no problems at all in taking initiative and being in charge of their own activities. The kids that are very dependant on the facilitators, are the ones that are mono-cultural Mexicans – particularly the ones from families with scarce economical resources. I know enough about how the majority of Mexican families educate their children and how the traditional school system works, to not be very surprised. The challenge has been to find a way to work with them in order to support them without getting in the way. Thanks to the support of several ALFs we managed to make this week flow so much better than the second. Instead of leaving completely drained, the facilitators now leave happy and energised. Kids playing Ninjas. They love that game! The new challenge that is arising has to do with one very red child (check Spiral Dynamics for references) that is not functioning very well with the other kids, disrespecting both the community agreements and the student agreements. We have set up a plan of how to deal with all the situations that occur around this child and I´m quite thrilled to see how it will work out this coming. I was so happy to read your update. Thanks for writing it…since I was following your story. I am the parent of the second year student who wrote last week.